Like the Inca ruins from which this South Salt Lake gem takes its name, Café Machu Picchu (3018 S. State, 801-466-4908) is a treasure trove of mystery that begs to be explored. It's not the only Peruvian joint in town—Andean cuisine is starting to make a splash nationwide—but it just might be the most inviting. 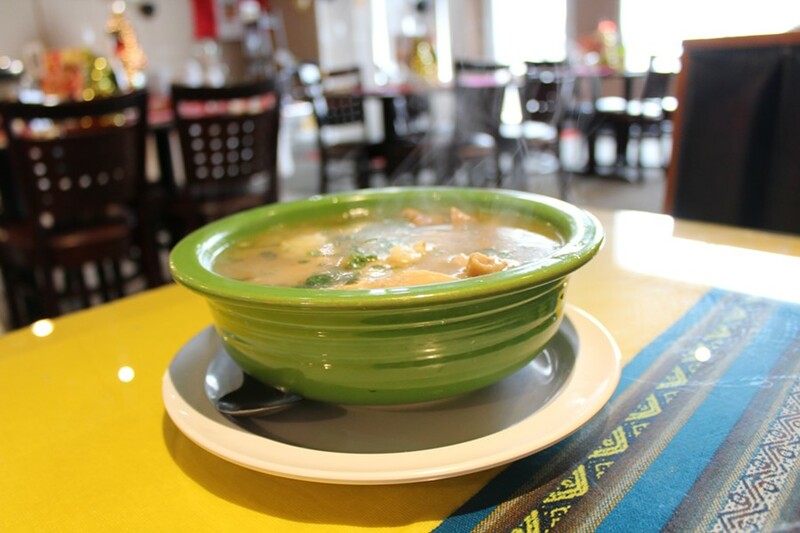 The menu holds fast to traditional Peruvian dishes, which borrow heavily from the cultural toolbox that European, Asian and African immigrants brought with them to Peru over the years. In short, Peruvian cuisine was experimenting with culinary fusion long before anyone on Top Chef. Because I'm dining a few days before Machu Picchu's annual New Year's celebration, the place is positively bedecked with holiday flair. Golden tinsel centerpieces that optimistically display "2018" stand proudly on each table and a well-trimmed Christmas tree presides over a performance space that I later learn will be used for some riotous karaoke come New Year's Eve. Beneath this gilded layer of seasonal cheer, the walls are covered with alpaca-fur blankets, traditional musical instruments and an array of paintings depicting stories from the New Testament—which are for sale if anyone needs to round out their collection. Taken altogether, it's a space that celebrates its cultural roots while remaining accessible to those who are visiting for the first time. Depending on what newbies are looking for in a restaurant destination, Machu Picchu has something for just about everyone—whether or not you're a fan of beef tripe. For those on the tripe-less end of that spectrum, the lomo saltado ($13.50 or $9.99 as a lunch special) or arroz de mariscos ($12.99, also available as a lunch special) are great places to start. The lomo is a harmonious mixture of steak strips that have been marinated and grilled to perfection, sautéed onions, peppers and tomatoes. It's all served atop a starchy bed of thick-cut french fries and accompanied by a softball-sized helping of white rice. 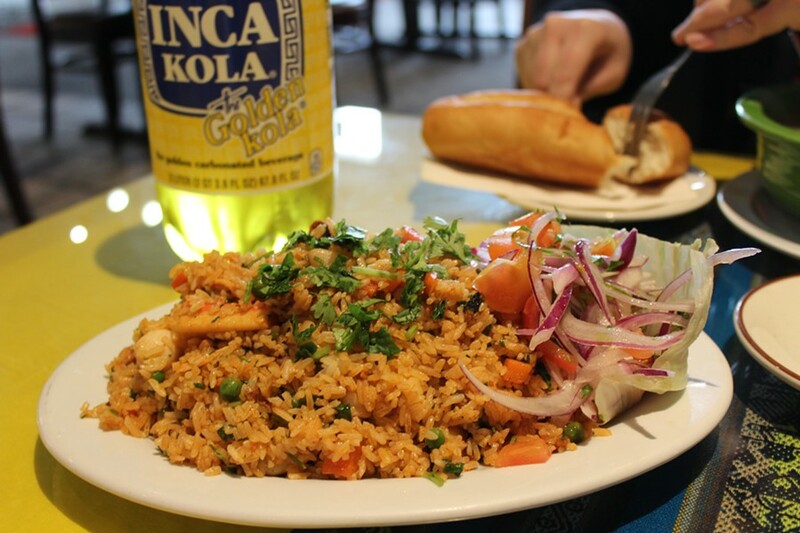 The arroz de mariscos is yet another reason to fall in love with Peruvian cuisine's penchant for food piles. It's a mammoth portion of rice tossed with a mixture of shrimp and calamari along with a generous helping of spicy heat. It's an unexpectedly satisfying meal to start off the day—nothing like fresh seafood and hot rice to jump-start the ol' taste buds. For those seeking a little adventure, make sure to check out the patasca ($11.99). Some places that offer tripe tend to downplay the rubbery bovine stomach lining, but tripe is the star of this Peruvian stew. It's accompanied by boiled potatoes and hominy, all of which is served piping hot in a broth supercharged with beef flavor. As this was my first time trying tripe, I have to say that it's not as terrifying as one might think. Chewing and cutting through the gristly mass presents a bit of a challenge, but tripe functions as a concentrated flavor sponge that imparts a surprising amount of character to this meaty dish. Wash it all down with a fruity Inca Kola for the full experience. If you're looking for a crash course in Peruvian cuisine, then cancel your plans for Saturday morning and check out the desayuno buffet ($11.99) from 10 a.m.-noon. Some standouts include a wide variety of tamales along with fried plantains, pan con chicharrón and the tripe-y goodness of patasca. It's a must for someone who is either extremely hungry or wants to take a deep dive into Peruvian cuisine—or both. There are many reasons why Peruvian cuisine should be welcomed with open arms, and Machu Picchu's dedication to beautifully presenting traditional food with some truly great service makes it an ideal entry point.